Nearly everyone involved with The Family Center knows about all the work that goes into our Annual Toy Drive and Holiday Party. We are especially thankful to three groups of volunteers, in particular, who helped us prepare for this 2017 holiday season. 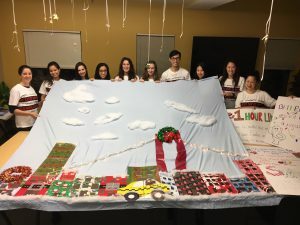 On Friday, December 1st, the MAC AIDS Fund sent volunteers who creatively conceived of, and designed, a backdrop for Santa. The group of MAC employees comes year after year to create the Santa backdrop. Their creative skills are so renowned that client families, staff, volunteers and community partners annually await their coming with baited breath to see what their latest creation will be. This year, it was a festive New York City skyline! Volunteers from JLL celebrate their hard work after sorting toys all night for our children and teens. 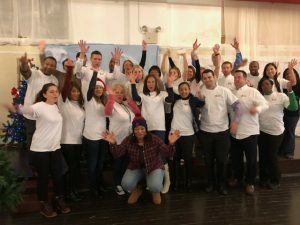 Then, in the lead up to The Family Center Annual Holiday Party on December 16th, volunteers from Liquidnet for Good and JLL sorted toys and gifts and decorated the event venue. We could not be more grateful to employees from MAC, Liquidnet and JLL for their selfless generosity of time, energy and holiday spirit!